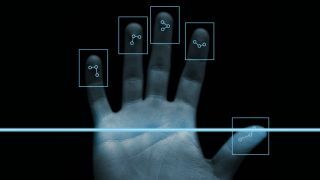 Fujitsu has announced that it has started work on a project to provide 2,000 tablets with built-in palm vein authentication, as well as a virtual desktop platform using the same tech. The platform should allow staff at Fukuoka Financial Group to access the bank's internal systems at sites away from the main campus. The tablets are scheduled to be designed and deployed by April 2014 to employees working off site for the banks that are part of the Fukuoka Group. As well as being security platforms, staff will be able to use the devices as ordinary business computers. The hardware to be used in the project will be the Fujitsu Arrows Q704/H, fully customised to integrate the palm-authentication sensors needed for the system. It will be the first tablet in the world to be embedded with the sensors, and will, the company says, enable high accuracy authentication which will prevent any unwanted access. In the event that one of the tablets is stolen, Fujitsu claims that no information will be lost due to encryptions on any data sent between the tablets and the home network. Furthermore, the tablets will send data not over the Internet but through a private network, delivering, the company says, 'solid security'. Aside from the palm technology, the Arrows Q704/H will be fitted with a 12.5 inch wide-screen and a Intel Core i5 processor, with Fujitsu hoping that the tablet will deliver the performance of a high-end PC on a portable working surface. The Fujitsu Arrows Q704/H will be showcased at the upcoming Mobile World Congress in Barcelona.